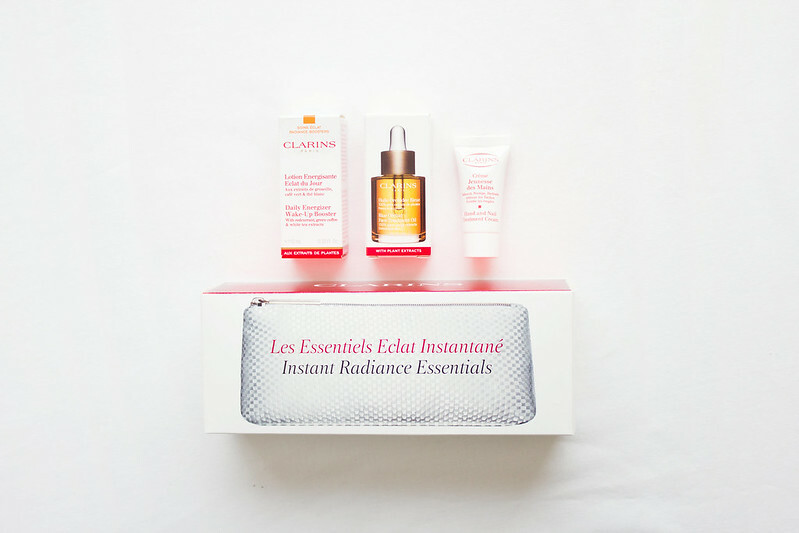 Clarins had an outrageously good online sale recently and I picked up the Instant Radiance Essentials set containing a full size Instant Smooth Perfecting Touch, a generous sample size of Beauty Flash Balm, and a make-up purse for a crazy price. What I like about buying online instead of instore are the sample selections most high-end brands offer with any purchase. Clarins provide a staggering amount of pages packed with samples to choose from; I selected the Daily Energizer Wake-Up Booster, Blue Orchid Face Treatment Oil, and Hand and Nail Treatment Cream. I'm more inclined to make further purchases if I've sampled a product but I find asking for them at local counters a dreadful experience I'd much rather avoid. 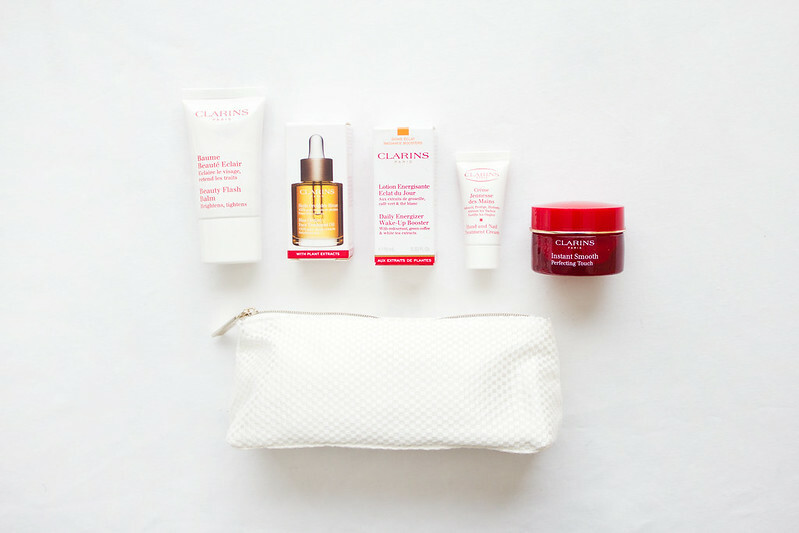 Clarins is quickly becoming my favourite skincare brand, I've only ever experienced excellent customer service from their counters, and the products I've tried have never disappointed me. The Instant Smooth Perfecting Touch can't be beaten when it comes to primers and so far I'm impressed with each of the samples I was given. I hoped to get this post out before the sale was over except I must have placed my order at the tail end of the promotion. If you did manage to catch it, what bargains did you get? I've heard great things about the Instant Smooth Perfecting Touch. I agree about asking for samples though, you just get the death stare and I find counters so effing intimidating! The Instant Smooth Perfecting Touch is just wonderful, you should definitely try it if you haven't already. UGHH. I do think it really depends on the actual department store you're in rather than the counters themselves, I'm sure the high end companies actually want you to trial their products (hence why they give you so many freebies online) - it's more likely the staff being ruthless dictators. I do have to say that I always feel really welcome at certain counters though and the Clarins is one of them. Clarins Instant smooth is beyond perfection. I always carry it with me in my little make up travel bag! I have yet to try the loutus oil though. I haven't tried the lotus oil (although I'm curious), I've tested the little sample of orchid oil and I think it's not right for my skin. I have 'normal' skin and rarely suffer any issues, so the oil is a little too heavy for me - it smells lovely though. YES. I want to try this so much. Ugh, I am so obsessed with Clarins right now. The sale was just so good. Luckily their products are totally worth buying at full price so don't feel like you missed out too much. I've heard so many great things about Clarins products, especially the Exfoliating Toner. I still need to try Clarins products out! Definitely get yourself a couple of their products to try, the primer is ridiculously good and their skin care is astounding.